Comments: (1) A joke circulating during Hosni Mubarak's reign ("Why hasn't Mubarak appointed a vice president?" "Because he can't find anyone dumber than he is") appears to be wrong. Tantawi is even more incompetent than Mubarak. Nov. 6, 2012 update: Egypt's Ministry of Utilities announced its intention today to quadruple the price of water to consumers over the next five years, ending a long-standing subsidy. retail and import sources are warning that the ongoing devaluation of the [Egyptian] pound will lead to large price raises in the immediate future, especially those of imported products. 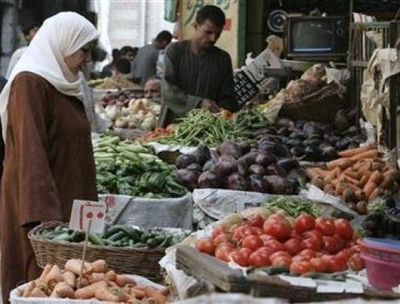 These price raises, experts say, will shock the Egyptian economy and drive it into further crisis. A source from a leading mass retailer told Egypt Independent that the company had already started to feel the impact on its supply prices. The source predicted that consumers will see an up to 20 percent price increase on imported products. Local products are likely to have their prices increase as well, but to a lesser extent than the imported ones. Egyptian products will directly be impacted, as most of them contain imported components such as raw materials, packaging and additives, experts say. And this general surge in prices, they say, will put inflationary pressure on all production costs. This trend has particular implications for carbohydrates, which make up about three quarters of the Egyptian diet. "Cereal and roots represent nearly two-thirds of the diet, and wheat alone makes up one-third. Reports place Egyptians as the world's biggest per capita bread consumers, and Egypt as the world's biggest wheat importer." Indeed, Minister of Supply and Internal Trade Bassem Auda just announced bread rationing of three loaves per capita to begin shortly. Looking at Egypt's poor finds harrowing statistics: According to a World Food Program survey in September 2012, 86 percent of poor households have insufficient income to cover monthly needs, up from 74 percent in June 2012. In those poor households, 62 percent of spending goes to food and 14.5 percent are already eating less. Mar. 5, 2013 update: Ahmed Kamel writes about Egypt's main staple in the Egyptian Gazette: "Despite soothing official assurances that Egypt's reserves of wheat are enough to cover local consumption until the end of the year, analysts warn against a bread crisis in the coming months, due to a shortage of hard currency." Apr. 15, 2013 update: David P. Goldman, writing as "Spengler," notes that "Egyptians are getting hungry." Currency devaluation has already imposed de facto rationing of essential commodities, and the shortage of diesel, propane gas cylinders, and other essential items has imposed energy rationing. The question is how long Egyptians can go hungry before the Morsi regime loses its capacity to govern. The only practical assistance the US has provided to the Morsi government took the form of a shipment of 140,000 teargas canisters. This arrived at the Abadeya Port in Suez, the Egypt Independent reported April 8. As matters stand, Morsi will need them. Perhaps Washington could follow up by donating coffins. So what is Egypt's government doing about this? The answer, sadly, is "not much." Egypt's current crop of Islamist leaders, wary of renewed social unrest and cognizant of how fragile their hold on power truly is, have steered clear of enacting significant structural reforms to the country's economic sector. … Instead, they increasingly have come to depend on the largesse of the international community. … the ideologically-driven policies of Egypt's Islamist leaders have depressed foreign direct investment, discouraged further lending (from the International Monetary Fund in particular) and neutered the tourism industry which once served as the lifeblood of the national economy. As a result, the Egyptian government has begun to devour itself. The country's foreign exchange reserves have constricted precipitously, plummeting from $36 billion at the end of the Mubarak era to just $14.4 billion as of April 2013. That, observers say, amounts to "less than three months' import coverage"—a dangerous state of affairs for an "import-dependent" economy like Egypt's. Should Egypt's Morsi Stay or Go?